Being a scientist and an amateur geologist and also a glassblower, I am especially excited to offer these beautiful angels to you. I am certain that if the three kings had known about this remarkable gem, they would have brought gold, frankincense and opal! Most people have heard of opals and many have seen them, but few have witnessed their magic. Whenever any light falls on their surfaces, they have the amazing quality to display, to flash, a wide range of the brilliant colors of the rainbow. The colors and their intensities change as one views the gem from different angles. In sunlight, some of the colors are spectacular, but even in a dimly lit room, most will still display a remarkable vivid "play-of-color". They are indeed magic gems. These are relatively new gem minerals. It was not until 1849 that geologists first found these amazing stones in Australia, which has become the dominant force in the opal market for over 100 years. But today, Ethiopia is becoming the second heavyweight in the opal market. The opals that I use on my angels are “rough opals” from Ethiopia. 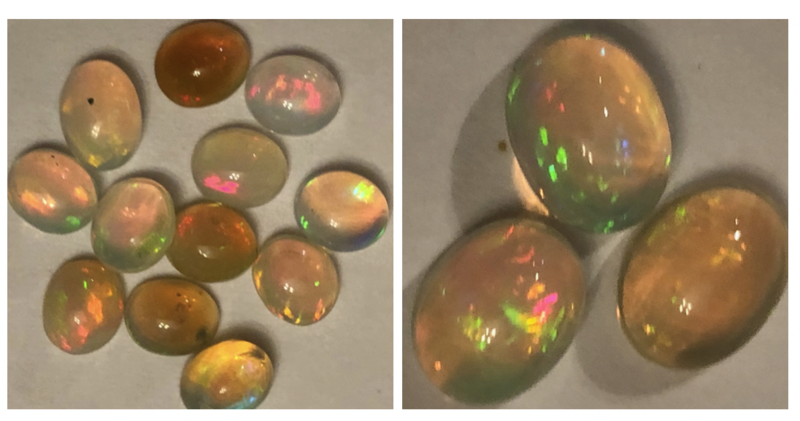 They are called "rough opals", because they have not yet been polished and faceted or polished into true gems that jewelers would use. 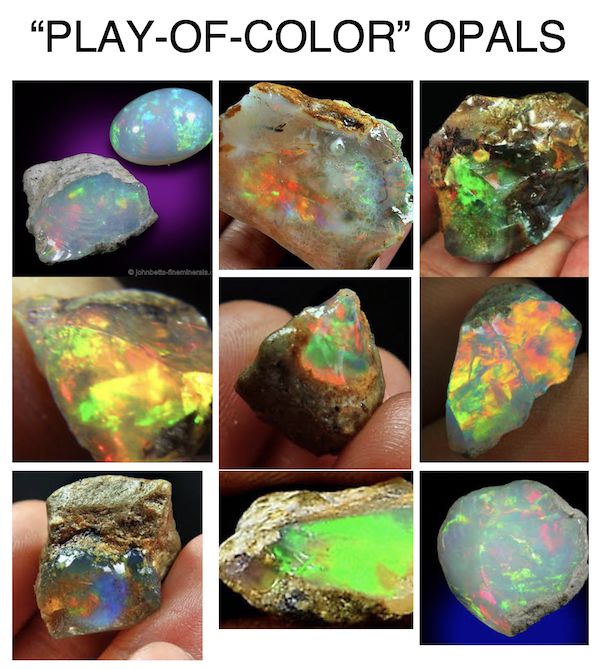 All rough opals include some of the matrix, the non-gem material in which the opals were found. Personally, I think that these are all the more interesting and beautiful because of this matrix material. For a number of reasons, I have increased angel prices for the first time in about a decade. This is partly because of the cost of the opals and partly because at age 77, it now takes me about twice as long to make each angel -- a fact that I just need to accept. Old age is interesting, but definitely a distinct privilege. Only time will tell how many more years I will be able to do this glassblowing. The total price for one 2018 Rough Opal Angel is $34.00 (Angel $31.52 + $2.48 Sales Tax). For those interested, in Marshall, we need to pay 6.875% MN State Tax + 0.5% County Tax + 0.5 City Tax, which adds up to 7.875%. Fortunately, I obtained all of my opal specimens through a wholesale dealer friend. Nonetheless, each of these rough opal cost me about $4.75 each. Please note that each specimen is different and will radiate different colors. 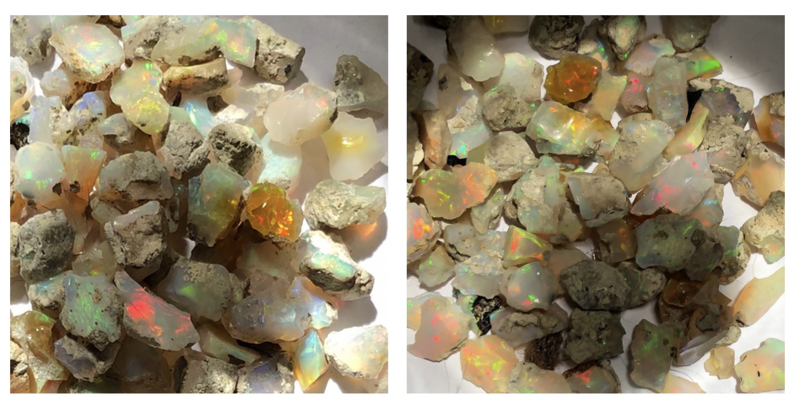 It is nearly impossible to capture the “fiery colors” in photographs, but those shown above and below will give you a general idea of what rough opals can look like. Keep in mind that the colors change as the specimens are rotated. Each opal and each angel is unique. Use arrows to purchase up to five 2018 angels. FROM MENU ON YOUR "CART PAGE"
select "WILL PICK UP" within the cart menu. 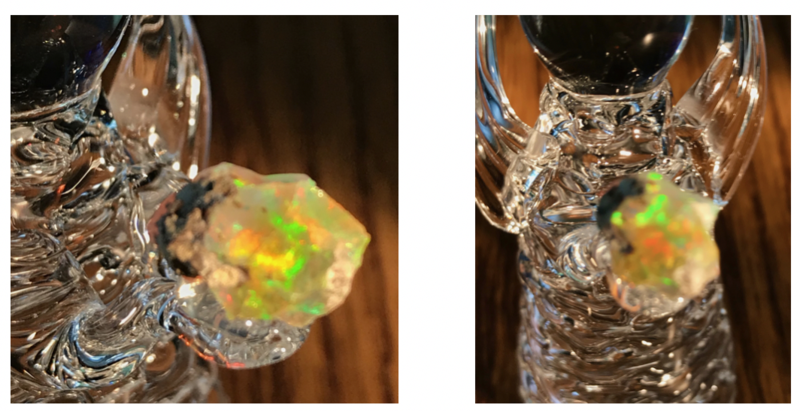 If you are a lover or gems, I have also created a very limited number of angels that include two different sizes of polished gem quality opal, and one that has both a gem-quality opal and also a “rough” opal. The polished gems come in two sizes, 0.43 carat (0.085 g) and 0.28 carat (0.055 g). To purchase one 2018 angel with 0.28 carat polished opal, select the button below. YOU MUST SELECT ONE OF THE OPTIONS BELOW -- REALLY!